DrumCore users have been waiting a very long time for a new version, but version 4 is finally here — and available for both Mac and PC. When DrumCore first appeared in the pages of SOS, way back in February 2005, it was a loop-auditioning interface that enabled musicians and producers with hard drives full of audio and MIDI loops to organise their collections of files. At that stage it was a Mac OS X-only product that couldn’t be used as a plug-in, but it did include a very desirable drum library featuring contributions from some of the world’s best drummers. 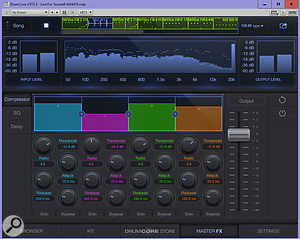 Version 2, reviewed in December 2006, introduced tempo-sync via Rewire, more MIDI and audio loops played by world-famous musicians, and support for REX2 and Acidized files, but although both PC and Mac versions were available at that point, the software still didn’t integrate as a plug-in. When its developers, Submersible Music, finally produced a plug-in, it was a version of their KitCore virtual instrument, which had been developed to provide a simple and cost-effective way for people to make use of the drummer MIDI libraries. It was the first of Submersible’s drum-related products I had the opportunity to review and I found it very easy to use. 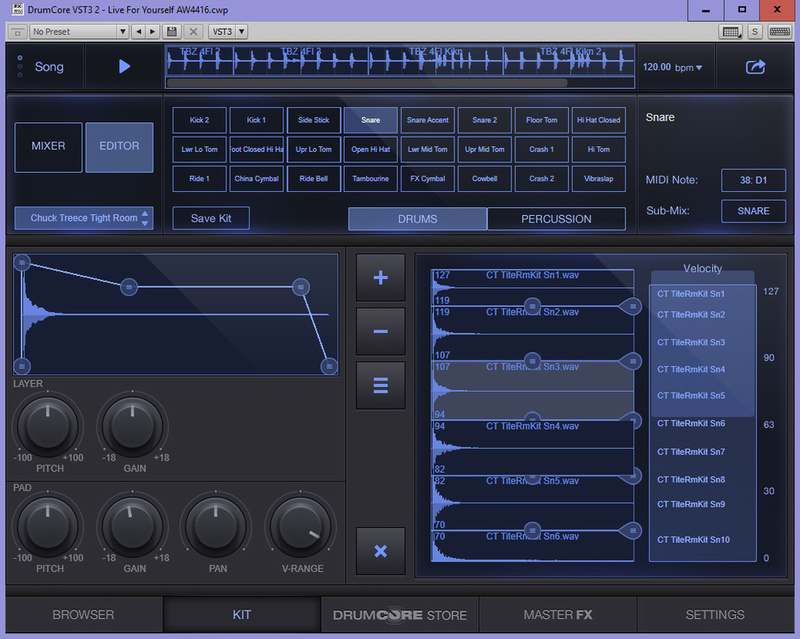 Soon after KitCore’s arrival, DrumCore 3 was unveiled, and this time it worked as both a stand-alone product and a VST/ RTAS/ AU plug-in. While the stand-alone component closely resembled previous versions of the software, the plug-in borrowed the fresh look and feature innovations of KitCore and thus signalled the ‘virtual instrument’ direction that DrumCore was headed in. At the end of my review, in SOS February 2010, I noted that Sonoma Wire Works had recently acquired DrumCore and other Submersible products, and expressed my uncertainty over their future. Still, it wasn’t long before Sonoma were promising a DrumCore Version 4 with 64-bit AAX/ VST3/ AU support, and at this stage its future looked bright. I held off moving to a 64-bit PC system in anticipation of v4, but suddenly everything went quiet. I suspected that significant licensing and design issues were preventing Sonoma from moving forward, so I went ahead and upgraded my PC. Then, towards the end of 2014, Sonoma suddenly began advertising the release of version 4 again and hope was reborn, although it's taken another couple of years of beta testing to get the product into a releasable state! 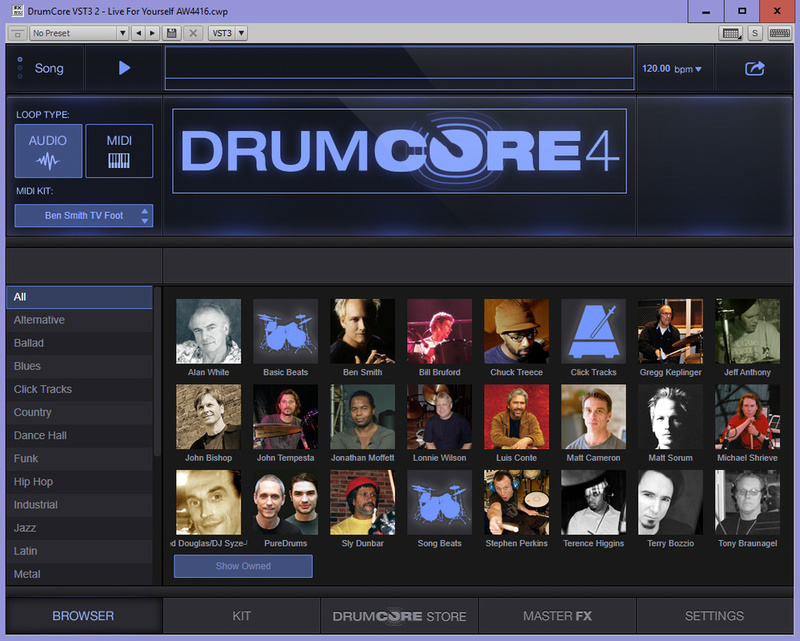 Now that it is finally here, there’s not one but four versions of DrumCore 4 to choose from. Lite is by far the cheapest currently available, but it only includes a limited amount of content, totalling 4GB. For approximately five times more money, there is DrumCore Prime Flash, which provides 20GB of MIDI and audio data on a 32GB flash drive. Then, for those who already have a drive they want to use, there is a DrumCore Prime Link option, offering the same content as Prime Flash but as a set of manageable downloads. Strangely, Prime Link costs the same as Prime Flash, so I know which I’d choose! The version sent to me for review sits at the top of the range and is aptly named Ultra. It cost more than the combined price of the other three, but includes a very attractive 120GB USB solid-state drive (an Oyen Digital Minipro USB 3) and an impressive starting quota of 50GB of MIDI and audio files. To be more precise, the user is given 139 multi-velocity sampled kits, 265 groove sets, 22,000 audio loops and 3000 MIDI loops. Although this is clearly a lot of data, the library covers a very wide range of drumming styles, so when broken down into genres, it doesn’t feel like as much! The Editor page makes it possible to edit every sample layer of each drum pad using an ADSR envelope, gain and pitch controls, and spacing controls. Content is also identified by the drummer that created it, and Ultra includes the work of 18 world-famous drummers (see the Ultra Drummers box for more details). For me and many others, the drummer libraries have always been the most attractive feature of DrumCore. At one time I did all my drum programming by entering MIDI data into a Roland MC50 hardware sequencer, but when I started using DrumCore I couldn’t resist working with its audio loops rather than MIDI. I began dragging the audio files into my DAW so that I could chop and edit them to make my drum tracks, and as a consequence, I have the likes of Terry Bozzio playing custom backing on many of my songs. Content is categorised by musical style and artist. In this window we can see Terry Bozzio’s Slow Torture set of audio loops. Audio fills are separated into their own folder, as are MIDI loops and fills.Another nice feature of DrumCore is that it allows you to choose a set of MIDI patterns created by one drummer and have them played using the sampled kit of another. This means that, for example, a jazz kit could be used to play some heavy-metal MIDI sequences. If that doesn’t work out, there are plenty of other combinations to audition and it only takes a menu click to do so. As far as I can tell, the MIDI and Audio content found in Ultra is derived from the excellent MIDI+24-bit/48KHz audio Drummer Packs that were available to version 3 owners (many of these were discussed in SOS’s previous DrumCore reviews). Indeed, there are discounted upgrade paths from earlier versions and a migration tool that enables users to move their libraries into DrumCore 4 rather than re-install them as downloads. Unfortunately, though, some libraries are no longer supported and cannot be migrated to the new software. These include Big Fish Audio’s Bone Crushing Drums, Brain: One Stroke Done, Brush Artistry, Jazz Drums, and Roots Of South America. Aside from making it a 64-bit AAX/ VST3/ AU-compatible product, the designers have significantly re-engineered the look of the plug-in so that it bears very little resemblance to version 3. When the plug-in opens, the user is presented with a panel of photographs of all the drummers that are currently in their library. 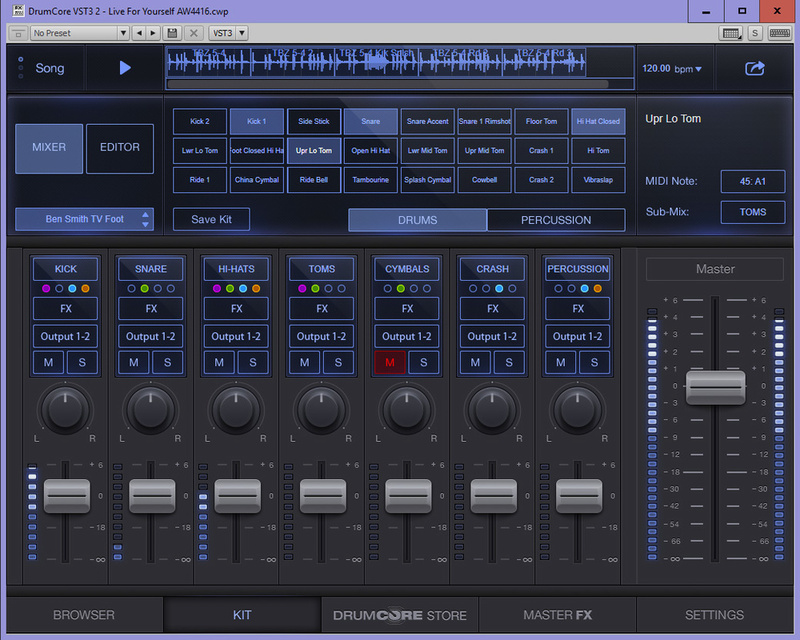 From here, the user can either click on a drummer and then browse a menu of their audio and MIDI performances, or narrow down the search by genre. When a suitable folder is selected, its ‘groove set’ of loops are shown in the window previously occupied by the drummer pictures, and from here they can be auditioned with a mouse-click, or drag-and-dropped into a song. It’s very intuitive. The Mixer panel enables the user to alter the balance of their MIDI output and to apply a custom mix of effects to each channel, as shown by the coloured dots in the screen above.On another tabbed page, called Kit, there is a seven-channel mixer for controlling the sound of subsections of the kits. From left to right the channels are labelled Kick, Snare, Hi-hats, Toms, Cymbals, Crash and Percussion, and each one features a level fader, pan knob, mono and solo buttons and effect insert options. Above the virtual mixer is a panel showing all the drum elements that make up the selected kit. Every kit includes 48 pads (split across two banks) which sound when clicked and can be seen illuminating the relevant mixer channel’s meters. Naturally, kicks are routed to the kick channel and snares to the snare channel, etc, but each channel can be renamed and every pad reassigned, so there’s plenty of scope for customisation. Similarly, the MIDI note pre-assigned to each instrument can be altered to any other by selecting alternatives from a pop-up menu. Currently, all channels are routed to the stereo bus via the mixer’s master fader bus, but multi-bus assignment is something that Sonoma have flagged up as a future update. Many users find that at some point they want to mix and match kit elements from different drummers to form custom kits, and this is pretty easy to do. Within the Kit tab there is an Editor button which calls up a set of velocity-layer editing tools at the expense of the mixer’s controls. From here the user is given control over sample-to-pad assignment so that they can, for example, remove all the samples that are currently assigned to a particular pad and re-populate the velocity layers with a custom selection. If the ‘even spacing’ button is engaged, the software automatically assigns velocity ranges of equal size (within the dynamic range) to each layer, but uneven spacing is also allowable, and it’s even possible to overlap layers to create dynamic ‘blend’ regions. Further refinements of each sample layer can be made by altering its pitch and gain, or by dragging any of the five nodes of an ADSR envelope. Alternatively, users can target the pad as a whole, rather than its layers, and change its pitch, gain, pan and velocity range. 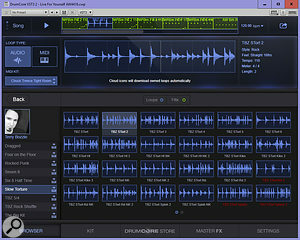 Admittedly, DrumCore 3 also enabled velocity layer editing and the free assignment of pads, but the interface was not as user friendly as it is now and the ADSR tool is new. Although many users like to do their drum processing within the host DAW, a provision of effects is standard fare for a virtual drum instrument these days, so it’s good to find that Sonoma have given some to DrumCore 4. Its insert effects comprise a compressor, EQ, delay and down-sampler called Crush, which mimics the truncation errors and jitter that old low-bit samplers introduced. Control is given over bit-depth, sample rate and filtering, so there’s much fun to be had testing out its crunchy extreme settings. The other three processors are pretty standard, but Sonoma’s designers have broken the mould a little by creating some unconventional controls for them. For example, the delay parameters use music notation rather than fractions, and the bandwidth of the EQ is altered by dragging a coloured panel outwards and inwards. I’m not sure if these ideas make the processors better, but they do force you to work a little more with your ears than your brain, which is probably a good thing. These four processors are available to each of the seven mixer channels, making it possible to have quite different treatments applied to every sub-section of a kit. The Master Effects include a delay, EQ and multi-band compressor. A provision of master effects is found on a separate tabbed page, and these comprise a four-band compressor and a delay and EQ that appear identical in design to their insert counterparts. Common to all of DrumCore’s tabbed pages is a panel called the Timeline, which sits at the top of the interface along with a play button, Loop/Song/Cue mode selector and tempo counter. It works a bit like the tracks of a DAW by allowing loops to be freely dragged and dropped into it. 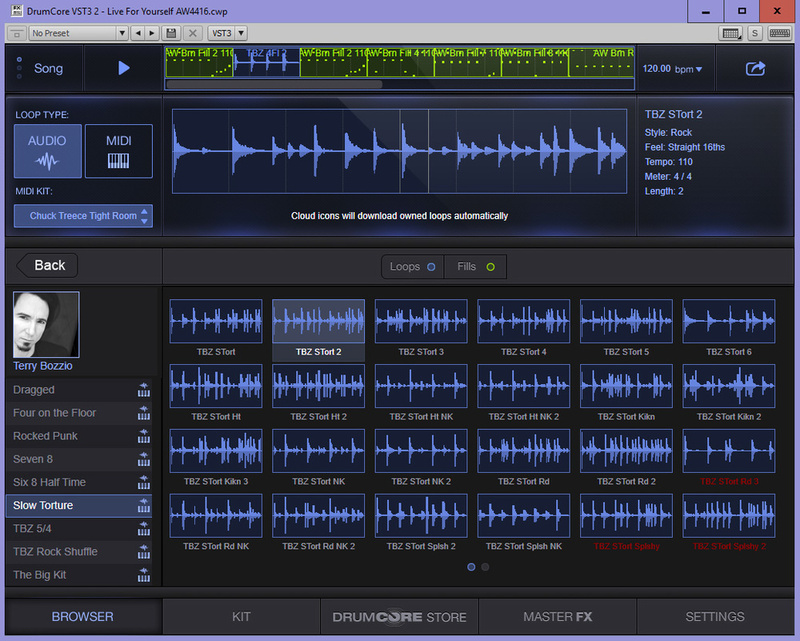 Audio and MIDI loops can be used indiscriminately, and DrumCore 4 automatically creates a render file of each loop at the session tempo. Timeline is certainly very useful for quickly and simply patching together a composition of loops and fills and probably a little faster than working directly with a DAW’s track pane. One last control worth mentioning is the Live Drummer slider, which is found far from everything else on a tabbed Settings page. Unlike the other DrumCore controls, which deal with individual drum pads and kit patches, it is a global function that affects the feel of everything. Drag the slider up and the loops become a little more loose; drag it down and they become tighter, but less human. Almost all of the functions of the DrumCore 3 stand-alone component and its plug-in counterpart have been incorporated into the version 4 design alongside its new features, but one noticeable absentee is the Gabrielize tool that was present in previous versions. In short, when the Gabrielize button was clicked, the beats of the selected loop were rearranged randomly to generate a new loop. It was fairly unpredictable but quite a nice tool to try out on occasion. I can’t say that I ever seriously used it much, though. Having abandoned DrumCore to upgrade my PC from 32- to 64-bit, it’s wonderful to be able to use its drummer libraries again. The stand-alone component of version 3 was starting to look decidedly tired, but now its features have been rolled into the plug-in and everything looks fresh and modern. Features like the mixer and its effects; the sample layer ADSRs; the Timeline panel; and the 120GB USB drive, are all nice improvements, and its comforting to know that Sonoma are committed to developing the product still further. While it has been in limbo, quite a number of new virtual drum instruments have appeared on the market, so competition is stiffer than ever, but most seem to focus on creating realistic virtual kits of particular eras and styles rather than providing the grooves of big-name drummers. This means that the loops and fills of DrumCore’s drummers are still a valuable commodity, and I for one am very happy to be exploiting them again. I can’t think of another drum instrument that takes the same ‘library of famous drummers’ approach as DrumCore, but there are plenty of alternatives that have their own strengths. Products like FXpansion BFD3, Toontrack Superior Drummer 2 and XLN Addictive Drums 2 all focus on offering the best drum recordings they can (typically using multiple mic positions), and provide a sophisticated virtual mixer with which to process them. Drumforge’s Drumforge I, created by producer Joey Sturgis, takes more of a hands-off approach, leaving the user to create their own drum kits and mic mixes from the high-quality raw material on offer. 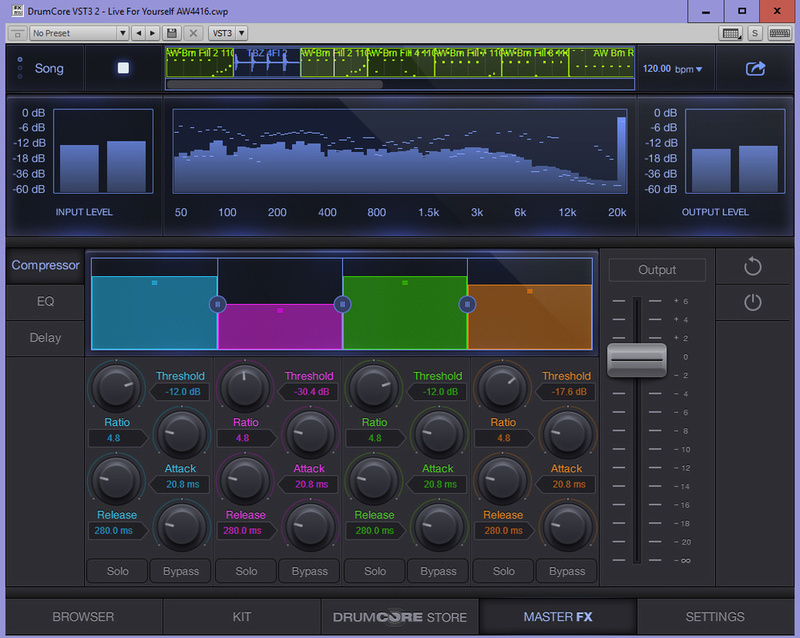 And then there are plenty of specific kit instruments available from the likes of Native Instruments and Drumdrops, although these use the Kontakt engine as a platform for their mixers and effects. Here’s a list of the 18 drummer libraries that are included in the Ultra version of DrumCore. Most genres are covered by one or more libraries, but I’ll leave it to you to look up the drummers’ impressive credits: Alan White, Ben Smith, Gregg Keplinger, Jeff Anthony, John Bishop, John Tempesta, Lonnie Wilson, Luis Conte, Matt Cameron, Matt Sorum, Michael Shrieve, Ned Douglas, Sly Dunbar, Stephen Perkins, Terence Higgins, Terry Bozzio, Tony Braunagel and Zoro. Additional drummer libraries that are currently available include Bill Bruford, Chuck Treece, Jonathan Moffett, Steve Gadd, Vingage 30s, Urban GT, Pure Drums, Basic Beats and Percussion. Fantastic drummers have contributed to the instrument’s library. Excellent variety and quality of audio and MIDI loops. USB drive provides welcome storage for drummer libraries and future purchases. Upgrade path from previous DrumCore versions. Some mixer functions are still under development. The absence of the Gabrielize feature might disappoint long-term users. Some Drummer Packs that worked with previous versions can no longer be used. The price of Ultra will be too high for some. 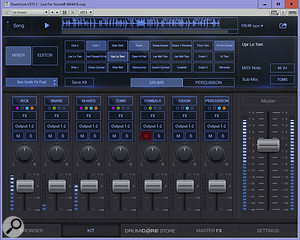 At long last, DrumCore is 64-bit compatible and includes a virtual mixer and palette of effects and processors. It offers good sample layering and custom kit-building tools and includes a huge library of audio and MIDI loops created by many of the world’s most famous and talented drummers, all stored on a 120GB USB SSD. Ultra $639, Prime Link $249, Prime Flash $249, Lite $49. Ultra $630, Prime Link $249, Prime Flash $249, Lite $49.